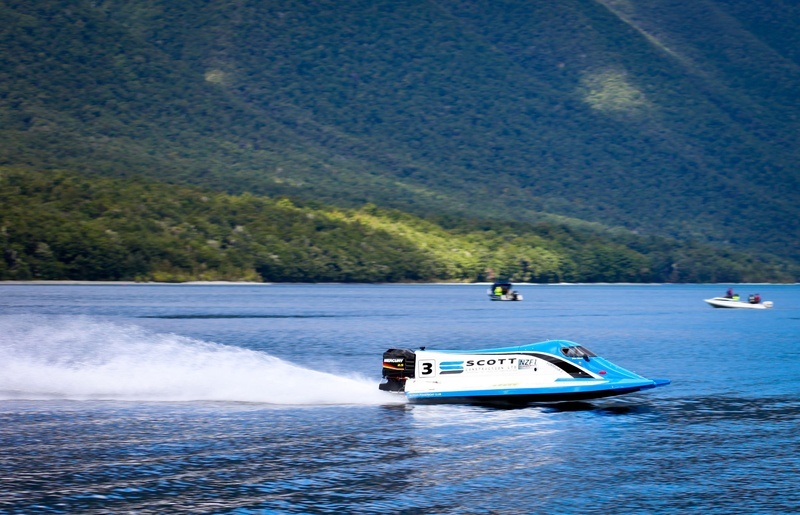 Round 3 was held at beautiful Lake Rotoiti near Nelson on 17 – 18 of March. The weather was fantastic and there was two days of good racing. After qualifying 3rd we were set for a good run in Race 1. Despite getting the ‘hole shot’ to the first turn, having to hold lanes quickly eliminated this advantage and we ran hot on the heals of our main Tour rivals for the whole race finishing 3rd. The ‘action’ of the day was Anthony Robinson (Design Windows) undertaking a near “blowover” and then major nose-dive while trying ‘whip’ up the inside of Julian in one of the turns. Fortunately there was no major damage to either boat or driver. With Race 2 being a reverse grid, we took advantage of a good position at the start and came out with a convincing 2nd over Luke Sharp in Promt Parts. Malcolm Jamieson (KRB Racing) managed to sneak past in the first turn and maintained 1st for the remainder of the race. We are “stoked” with this result and Julian seems to now coming to grips with the boat. Sharp lead the field in Race 3 on Sunday, Jamieson – 2nd, and us, again 3rd. These results leave us still maintaining 3rd in the NZ F1 Tour closely followed by Steve Pope from Cromwell (“The Vatican”). Unfortunately, later that day, in one of the Unlimited races on Sunday we melted a piston. This is a bit of set back for us but we will have this fixed for the Nationals and Final Tour round at Lake Kaniere at Easter. Our major concern here, is not so much repairing the engine, but the “why”?, so it does not happen again. With rumoured 40+ entries over all classes so far for the Nationals at Lake Kaniere (Hokitika) on 7 – April, it should be an excellent event. Also, Nationals Rules dictates that pole positions on the start grid are ‘drawn from a hat’. This will definately make things interesting…. Be sure to check out the videos on our site also!!! 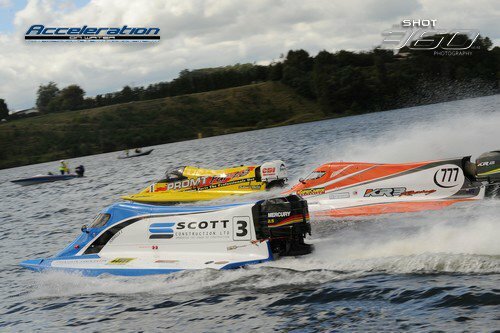 Latest news from Stilwell Brothers Racing comes from Lake Karapiro on 3 – 4 March 2012 once again set the scene for Round 2 of the NZ F1 Powerboat Tour. 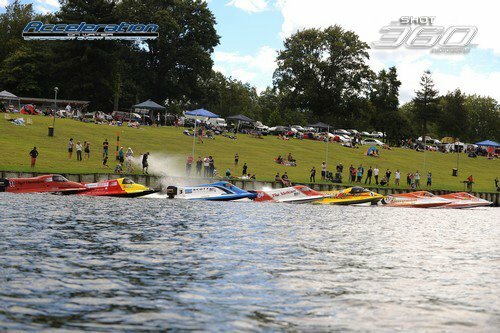 With racing cancelled on Saturday due to the remnants of the storm that travelled across the North Island, Sunday proved to be an action packed day with all 3 of Round 2’s Tour races. After qualifying 4th and a meagre 1/10th of a second behind Tour leader Malcolm Jamieson we looked forward to the first race knowing that our investment in a new propeller since Round 1 looked to be paying dividends. Despite battling with Malcolm Jamieson (KRB racing) for 3rd place most of the race, we settled for 4th. The big surprise was latecomer to the Tour, Anthony Robertson (Design Windows), who took out the race win, followed by Luke Sharp and Jamieson. With Race 2 being a reverse grid race, we got a superb start and fought over 2nd place with Steve Pope from Cromwell for most of the race. Unfortunately, the second to last lap saw a momentary engine cut-out which was enough to let past Robertson and Sharp for 5th place. We were extremely disappointed with this as it would have given us quite a few points up on Sharp who is our main rival for second in the Tour at this stage. With conditions worsening, Race 3 was rough, and we were happy to take another 4th place not having 10/10 confidence in the new boat yet. The action in this race was a large nose-dive/spin out by Sharp immediately after the race finish. Fortunately, no major damage was suffered to boat nor driver. Overall, we are happy with the round result and going into Round 3 at Lake Rotoiti on 17-18 March we hope to have a home course advantage (although Malcolm Jamieson being from Picton also has a good knowledge of Rotoiti) and with the Tour only being half way through it is too early to call a winner at this stage. Bring on Rotoiti! !